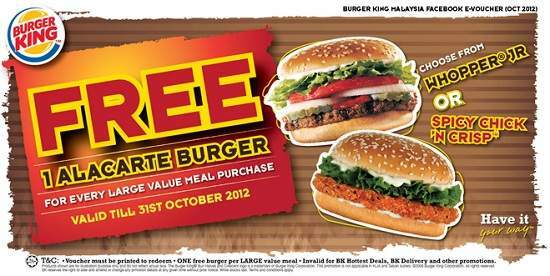 FREE 1 alacarte burger for every LARGE Value Meal Purchase! Burger King facebook fans have reached 100 000! To mark this occasion, BK has a very special gift for all you BK Fans. Just click onto the 'FREE BURGER' link & get your e-voucher. Remember to LIKE & SHARE out this great e-voucher ya!